Much of the information contained in this manual parallels similar equipment information for Western Electric, Stromberg Carlson, etc. 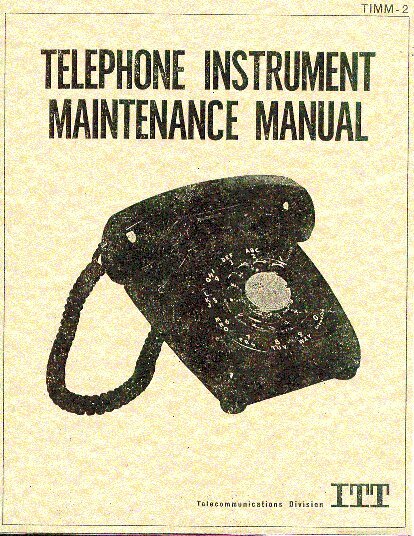 since Western Electric licensed much of their technology and product specifications to companies like ITT who provided equipment to the "Independent" telephone companies. Currently, only chapters 1 and 2 have been scanned and about half of chapter 3. Chapter 3 consumes one-half of the total pages in this manual and will take some time to scan/crop/clean the images - more time than I have spare time to do right now but hopefully in a few months I will have completed this manual. All files linked from the Table of Contents below are in PDF format. If you do not have the Adobe Acrobat Reader for opening and printing this type of file, you can download the latest version from the Internet. Section 110. - Identification and Ordering Information - 110 - click HERE. Section 130. - Lubrication and Cleaning - 130.01 - click HERE. Section 140. - Trouble Shooting - 140.01 - click HERE. Section 150. - Tools and Test Equipment - 150 - click HERE. Section 210. - Handsets - 210 - click HERE. Section 220. - Dials - 220 - click HERE. Section 230. - Networks - 230 - click HERE. Section 240. - Ringers - 240 - click HERE. Section 250. - Contacts and Switches - 250 - click HERE. Section 310. - Miscellaneous units - 310 - click HERE. Section 320. "Cinderella" Phones 320 - click HERE. Section 330. Wall Phones 330 - click HERE. Section 340. Desk Telephones 340 - Not scanned yet . . . check back later.